As the contemporary art market becomes ever more diversified, does the distinction between the work of trained artists and that of their self-taught counterparts really matter? For as long as anyone who has paid close attention to the aesthetic issues that have shaped the outsider-art field can remember, a clearly delineated, market-imposed border has separated work made by talented autodidacts—artists who have tended to live and work away from the cultural and mass-media mainstream—and the creations of their peers who studied art-making and art history in specialized schools and became recognized as “professional” artists. For the most part, those in this latter category have been aware of the historical and critical contexts in which they have made and displayed their work and have produced works to be publicly presented and sold in the established art market. By contrast, for a long time the art establishment’s opinion-shapers undervalued much of the work of self-taught or “outsider” artists, several legendary examples of whom came to the attention of the mainstream art world in the 1940s and ’50s thanks to the enthusiasm of the modern artist Jean Dubuffet. The French painter-sculptor dubbed such works “art brut,” or “raw art”—referring to the unbridled creative energy they embodied and reflected—and was moved by their deeply personal character. Here was art, Dubuffet argued, whose makers produced it not because they wanted to but because they had to; their urgent need to create allowed them to tap into the life force itself. The history of outsider or “self-taught” art, as it is sometimes called, is about a century old. Its roots can be traced to the discoveries of the works of certain autodidact artists in Europe and to distinctive variations of vernacular art forms that sometimes popped up on the margins of mainstream art history. The market for self-taught art is younger, about a half-century old. In the United States, commercial venues such as the Janet Fleisher Gallery in Philadelphia (which opened in 1952 and is now the Fleisher/Ollman Gallery), the now-defunct Phyllis Kind Gallery (Chicago and New York) and, in New York, the Luise Ross Gallery, Ricco/Maresca Gallery and Cavin-Morris Gallery, played key roles in the development of a market for the work of self-taught artists. In some ways, over the years Dubuffet’s aesthetic heirs, who shared his passion for the art of the self-taught and often longed to see it win the respect of the establishment, have seen that dream come true. In New York, the American Folk Art Museum has presented important exhibitions of what it calls “contemporary folk art” for more than a decade. In Baltimore, in 1995, the outsider-art enthusiast Rebecca Hoffberger founded the American Visionary Art Museum to showcase the work of self-taught artists from around the world. The annual Outsider Art Fair in New York (February 11–13, 2011) and other similar events in other cities offer specialized settings for dealers in the field to present their latest discoveries. A still-expanding literature—in category-specific books, exhibition catalogues and magazines—has documented many aspects of this singular art. Has the market-imposed line between work created by outsider artists and art produced by their trained counterparts begun to blur? If such a trend is simmering, as the exhibition programs of some galleries and museums nowadays might seem to suggest (even the Museum of Modern Art in New York has included self-taught artists’ works in some group shows of drawings), then in plain marketing terms, can the work of some unschooled artists be seen as having successfully crossed over into the contemporary category? Late last year, Ricco/Maresca showed the enigmatic mixed-media drawings on paper of George Widener, a North Carolina-based autistic savant whose elegant compositions in black and white, highlighted with just a few basic colors, sometimes show strong affinities with those of modern artists known for their simple lines and stripped-down geometry. Widener’s pictures are sophisticated visual depictions of the complex calculations he does in his head in seconds, based on certain dates, such as that of the sinking of the Titanic on April 15, 1912, that seize his imagination. Marlene Dumas, the South African-born contemporary painter whose watery images of pregnant women, naked adolescents and closely cropped human faces won critical praise in a traveling exhibition that opened in Los Angeles in 2008, has observed that, in his numbers-based artworks, Widener “constructs worlds of infinite vulnerability” and that, as someone preoccupied with disasters, he is “a modern artist of the tragic.” Dumas’ appreciation of Widener’s drawings and sensibility offers a good example of the appeal the most original self-taught artists’ work has to some of the international art world’s most celebrated figures of the moment. 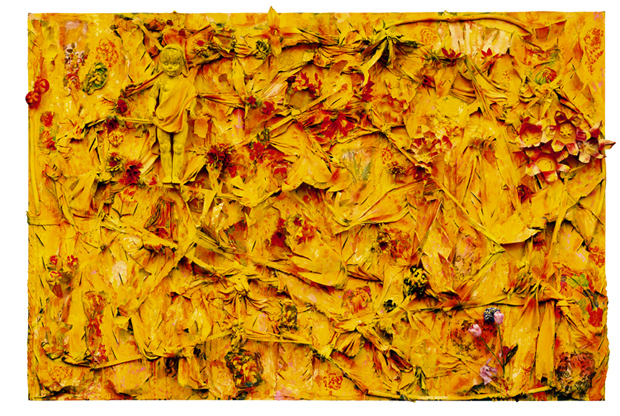 Conversely, it is interesting to note the affinity many of Dumas’ loosely elaborated paintings share with some of the brushiest, most impulsive-feeling bodies of work to be found in the outsider field, such as the late Mose Tolliver’s images of people and animals in house paint on plywood, or the late Jimmy Lee Sudduth’s pictures in mud and natural pigments on board. Some of the most impressive evidence of how far outsider art has come to be appreciated by the contemporary-art establishment will soon be seen in “Hard Truths: The Art of Thornton Dial,” a career-survey exhibition of the work of a self-taught Alabama artist whose mixed-media paintings and sculptures are as thematically far-reaching as, say, Anselm Kiefer’s haunting tableaux that evoke Germany’s Nazi past. “Hard Truths,” which will feature some 70 of Dial’s works in different media and formats, will open at the Indianapolis Museum of Art on February 25 and run through May 15. Then it will travel to several other museums in the U.S. through 2013. It will not be Dial’s first museum presentation; to date, his work has been featured in several big shows of this kind, including one at the Museum of Fine Arts, Houston, in 2005–06, and another that took place simultaneously at the New Museum of Contemporary Art and the American Folk Art Museum in New York in 1993. This time, though, the IMA will not primarily promote Dial as a self-taught artist whose status as an art-maker is off the grid or whose creations may be seen as odd. Instead, most convincingly and appropriately, the IMA’s exhibition, which has been organized by Joanne Cubbs, its adjunct curator of American art, will position Dial as one of the most relevant artists of his time, completely in touch with the issues of the moment. A former bricklayer, carpenter and welder, who once worked in a Pullman railway-car factory, Dial has spent his life in and around Bessemer, Ala., where he still resides today. Completely hands-on in his approach to art-making, Dial has used everything from animal hides, plush toys and barbed wire to spray paint, bones and carpet scraps to produce his mixed-media paintings and assemblages. His “self-invented expressionistic style,” Cubbs notes, has prompted comparisons of his art with that of such exalted modern and contemporary art stars as Jackson Pollock, Jean-Michel Basquiat and Kiefer. Both the Dallas-based collector Karol Howard and the New York dealer Luise Ross feel that, more and more, general art audiences are appreciating both self-taught and trained artists’ works without drawing strict distinctions; they credit outsider art’s increasing presence in museums and art fairs for helping to steer this trend. Howard and her husband, George Morton, have built a collection that seamlessly brings together self-taught and trained artists’ works in many different formats and media. Howard says, “What kind of artist may have a made a particular piece is less important to us than its overall strength and the appeal of its subject matter.” However, Ross notes that, in the still-ailing art economy, “there are no younger clients; young people look at the work but never inquire about anything.” Even if outsider art may appear to some to be breaking out of a label-limited category, she suggests, it is solid sales that give an art-market trend its momentum.